When it comes to working in the industry of logging, your number one priority should be safety. One slip up might cost you big. Fortunately, Chippewa Insulated Waterproof Super Logger Boots are here to the rescue. When compared to other logger boots, this pair of boots of Chippewa has the right safety features that you need. But, will it last? Is it for everyone who needs working boots? Chippewa Insulated Waterproof Super Logger Boots are perfect for everyone who requires everything. It takes pride from being a waterproof leather boot, an insulated boot, and a steel toe at the same time. Chippewa Logger Boots feature true waterproofing with waterproof, yet sweat-permeable membrane. This boot has also a nine-inch oiled leather shaft over a leather foot. Other features of Chippewa Logger Boots include triple ribbed steel shank, two inches logger heel, goodyear leather welt, durable Vibram Tacoma logger outsole, speed hooks, tarnish resistant hardware, stay-put, heavy-duty waxed laces, and a removable Texon 460 insole that’s waterproof. Nothing beats Chippewa Insulated Waterproof Super Logger Boots. Its waterproof leather design will keep you protected and dry and its thickly treaded rubber outsole makes the boots more durable and provides superior traction. Each lug incorporate in the design of this boots has been placed for braking, traction stability, kick off, oil resisting, slip resistance, and good abrasion. This exclusion compound is made for maximum traction in different terrains like wet surfaces. This outsole also keeps its physical properties in cold winter season. This feature is thicker and loftier than the previous Thinsulate insulation to provide more comfort and greater warmth, but still thin enough to enable movement’s complete freedom. 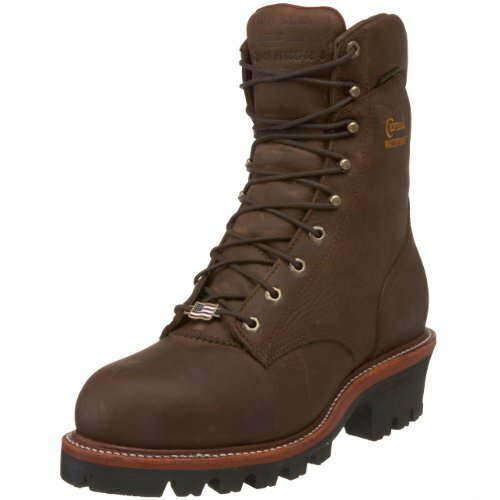 These Chippewa Loggers Boots contain 400g of 3M Thinsulate Ultra Insulation. This waterproof membrane system allows Chippewa Insulated Waterproof Super Logger Boots more breathable. The water is locked out of the boots by the membrane shield, yet air passes through from the foot for comfort. This key feature delivers superior comfort through the moisture management lining system that’s quick drying and breathable. They are referred to as super loggers for a reason. They’re possibly one of the high quality logger boots you can purchase. Such work boots are made to provide users with extreme traction, extreme comfort, and extreme ankle support. Aside from that, Chippewa Insulated Waterproof Super Logger Boots are made to last and they are very durable. Made from topnotch quality materials, it isn’t available at a cheap price. Chippewa Insulated Waterproof Super Logger Boots cost more than the typical work boot, yet when it comes to loggers boots, they are worth your investment and will surely offer you numerous benefits that other working boots can’t offer. To top it all, Chippewa Insulated Waterproof Super Logger Boots are a good choice if you are looking for a quality made and reasonably priced working boots. In the industry of logging, having this pair of boots will absolutely benefit you by ensuring your safety and health. If you have doubt about how these boots will benefit you, read more about Chippewa Logger Boots review.